The MacBook Pro retains the same radical redesign, love it or hate it, that we saw in the previous revision. That includes some choices that upset some users. The keys still lack travel, which can be less satisfying for regular typists. There’s still a TouchBar and no dedicated “Escape” key, apart from one entry-level model (and that entry-level doesn’t get any upgrades). You’re still going to need dongles to cope with the USB-C port. And these models are expensive, especially once you figure in their high-end internal storage and RAM configurations. The 13″ model, the one that’s more affordable, is paired with only internal graphics. The 15″ gets dedicated graphics, but from AMD – and Adobe software is largely optimized for NVIDIA. Okay, so what’s the good news? Well, don’t be too glum. Apple have given these machines insanely powerful CPUs. 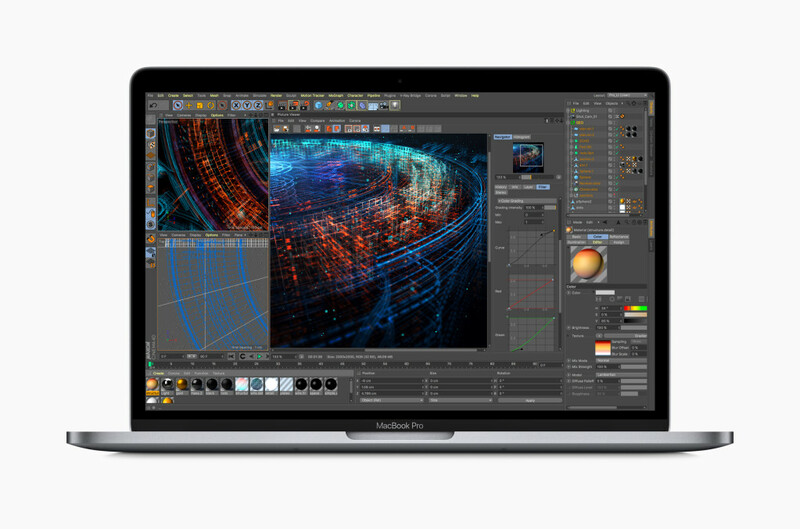 The 15″ MacBook Pro offers 6-core Intel Core i7 or Core i9 processors. Even the base model there gives you a pretty stupid amount of CPU power – and that’s great for audio, or running expensive soft synths. The 13″ MacBook Pro gives you Quad-core Intel Core i5 or i7 processors. The other features are more consumer-oriented, perhaps – there’s a True Tone display that adjusts its color temperature automatically, as found on the iPad, and a quiet keyboard. But if you’re looking for a silver lining, it’s those CPUs. Powerful CPUs + macOS as the platform + the ability to service Apple laptops around the world easily + fast connectivity via those USB-C ports for audio and storage = a MacBook Pro that will make a lot of pro musicians happy. The previous MacBook Pro was no slouch, too, so the other good news is, obviously, bargain hunters can (and should) consider shopping around for used or refurbished or open box models at discount prices. The trick is configuration. You want to save some money by getting the model without TouchBar, but I wouldn’t recommend that – you get only two USB ports and slower processors. It’s better to shop around for refurb or used and just live with the TouchBar, frankly. I had a MacBook Pro to test last year. The keyboard I found a bit uncomfortable, but I didn’t have the reliability issues some users have reported. And talking to a lot of musicians with these machines, they’ve all been really happy – if they did express some frustration at being poorer, or having to make spec compromises they didn’t want to make, or both. But they did like the machines. As always, Apple’s industrial quality feels great – the machines are slim, the displays are gorgeous, and the keyboard is … okay, well everything but that keyboard. The TouchBar also seems to grow on people over time, and there are some options for creating custom shortcuts – nothing I’d write home about, and not really a reason to buy the machine, but something that could make you happy enough once you already own the laptop. No, the problem is, Apple are still damned pricey. You probably want 512GB of internal storage so you aren’t constantly swapping around files just to connect a drive. High-end specs, to be sure – but at a high-end price of US$2799. The price premium for Apple is hefty. And Windows is a perfectly serviceable operating system for audio production, if you’re willing to make some adaptations. Just be careful in the PC market. You can get some high-end GPUs, which appeal not only to gamers but for video production and creative live visuals (and running Adobe software), but it’s also clear why Apple didn’t opt for NVIDIA – those machines, even though they now increasingly conserve battery life, can run hot. And other PCs, while they have cheap sticker price, show that part of how they got there was cutting corners on industrial design. Check out The Verge’s guide to gaming laptops for a sense of what that picture looks like. The issue with Apple, though, is that if you do go for a mid-range GPU – the same class that Apple includes in their machines – you can get PC laptops with similar industrial design and much better specs at a lower price. And that’s not the best news for Apple. It’s kind of a weird time to buy a new laptop – well, as usual. (Compromise! Always…) I’d love to see Apple improve their industrial design here, by coming up with a better keyboard and answering concerns about the GPU, or simply making a more competitive entry level option. But while the PC is stronger than ever, it does feel like we’re just one generation early when it comes to NVIDIA finally getting GPUs with desktop performance but low power generation and heat generation (and they are close). But that’s just if you care about GPU. For audio production, it’s the CPU that really matters – and hot damn, no complaints there. Both Apple and the PC offer blazing-fast CPUs that still have absurdly long battery life. They now also both have high-speed buses – which on the PC had for a while been a stumbling block. If you really want a Mac, I’d bargain shop to get a previous generation model with fairly high specs. If you want a PC, don’t fear Windows (and for that matter, Linux) too much. At least now the landscape is fairly clear as we come into the end of the year. If you’ve been putting off a purchase and suffering with an old machine, the rich array of software that will run on these faster CPUs I think will mean a purchase now will make you pretty happy musically. There’s great hardware out there, but it’s also an exceptionally wonderful time for making music in the box, too. And it’s hard to complain about that.